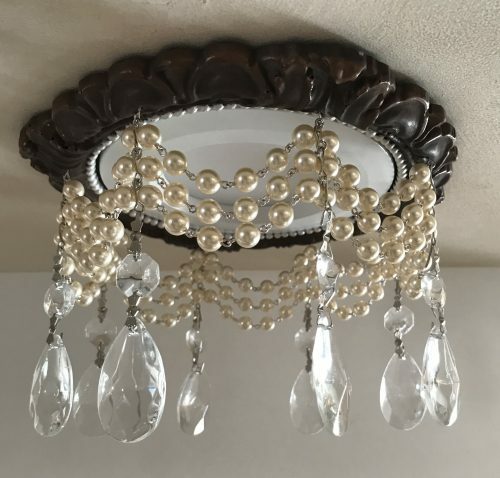 The 30% Off – First Ever Sale on Recessed Chandeliers is a great opportunity to purchase this totally unique decorative option for recessed lighting at a GREAT price. We are also introducing a brand new recessed chandelier style with 8mm cream colored pearls for the chain. Shown here with 3″ Clear U-Drop crystals with silver pins. $252. Price through February 15th is $176. The 30% discount offer will be effective through February 15th. 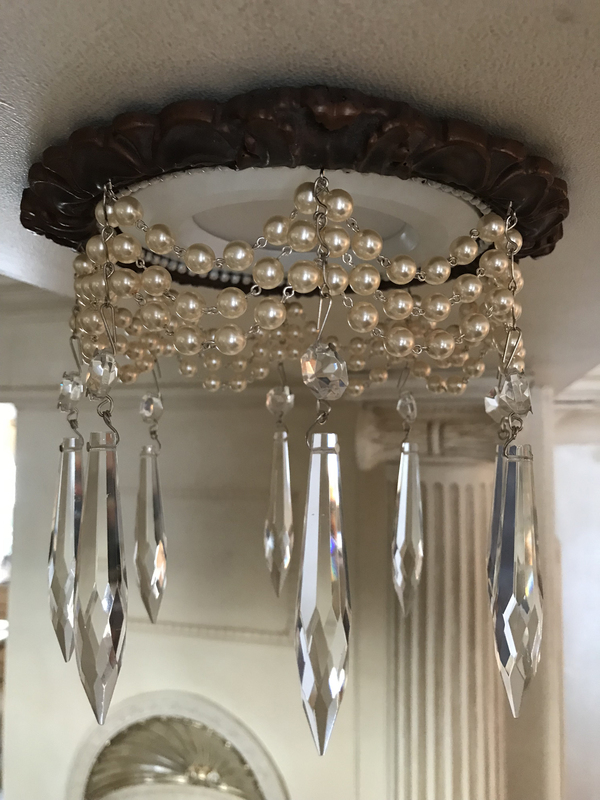 To qualify for the 30% off please email a picture of your recessed light canister, without a bulb, to info@beaux-artsclassicproducts.com and put in the Subject – 30% Off Recessed Chandelier Sale. The reason for this is most people have trouble figuring out what size recessed chandelier will work with their recessed light canister. Sales are final with this 30% Off Offer so we will make sure that your recessed chandelier is the correct size for your recessed lights. Our Recessed Chandeliers have lots of options. The new Pearl Style can be ordered with 1-1/2″ U-Drops and 1-1/2″ Tear Drop Crystals. Retail $215 Sale $150. We do not have all the product photography for all the sizes as yet in the store. The Pearl style is photographed with a 4″ recessed light LED Retrofit. We can create this style in all the sizes we offer for our Victorian Style Decorative Recessed Light Trim. Recessed Chandeliers are highly customizable. First choice is the finish on the recessed light trim itself. We offer over 14 Finishes for your decorative recessed light trim. When you know the correct size for your recessed chandelier, visit our recessed chandelier store to select the perfect chandelier style for your decor. Shown here our 6″ Victorian Style with a single clear crystal chain and 3″ U-Drop crystals. regular price $142. Sale Price $99. This handsome style starts with our Tuscany Decorative Recessed Light Trim and is available with a 20mm or 30mm Swarovski ball. Elegant triple crystal chains styles. Available on all sizes of decorative recessed light trims. To receive a 30% Off Coupon take a picture of your recessed light canister without the bulb and email it to info@beaux-artsclassic products.com. The photo of your canister will help us to determine the correct size for your recessed chandelier. We will email you your 30% Off Coupon and the correct size for your recessed chandelier. Visit the Home Page for 30% Off First Ever Sale Information on Recessed Chandeliers.